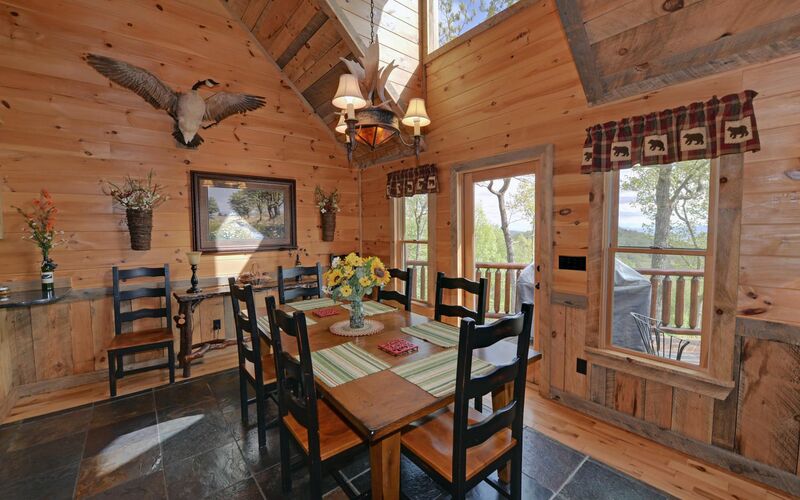 Heaven`s Doorstep is a rental cabin with plenty of natural light coming through the cabin's large front windows, and the porte-cochère provides cover when loading and unloading your travel gear. 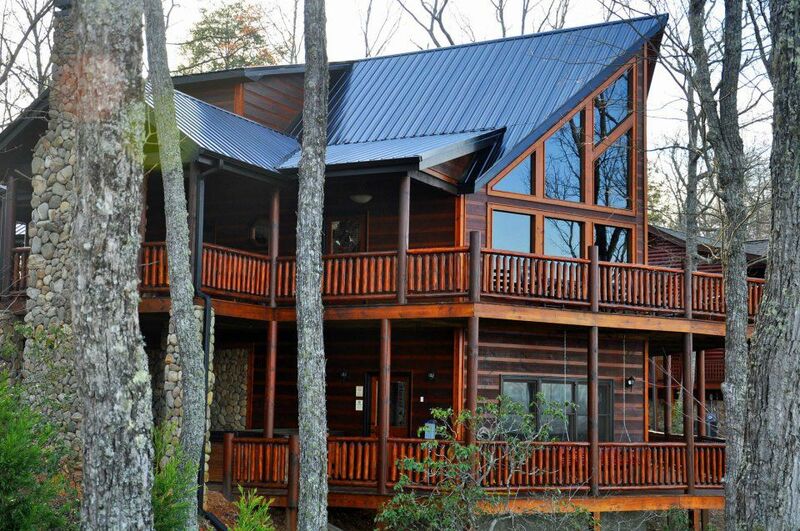 Our guests love the beautiful N. Georgia scenery and rolling purple ridges that surround this cabin and Lake Nottely. 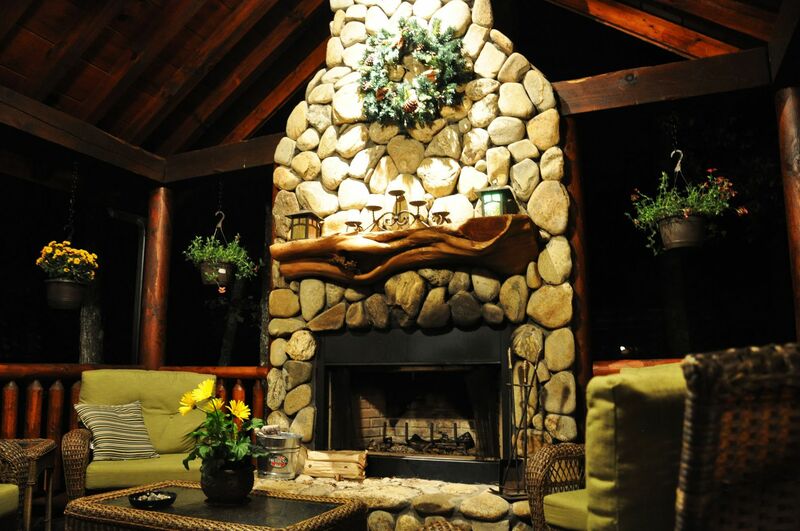 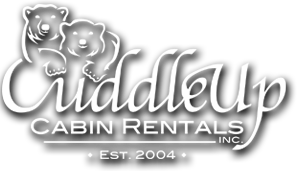 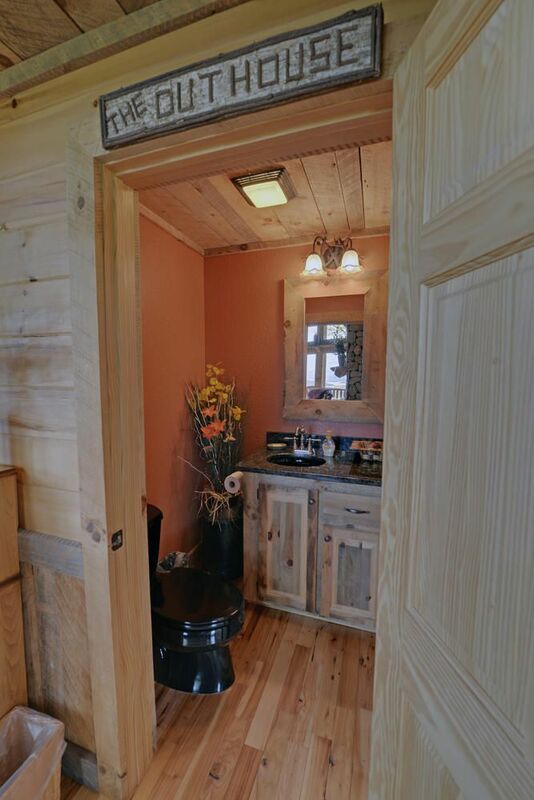 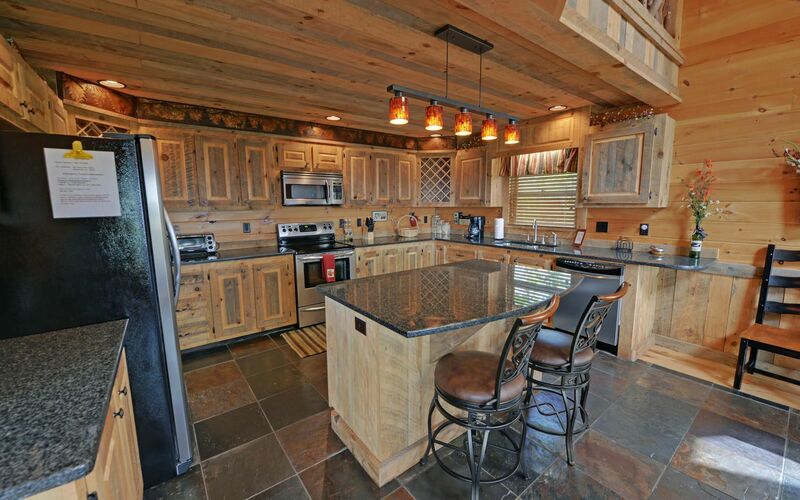 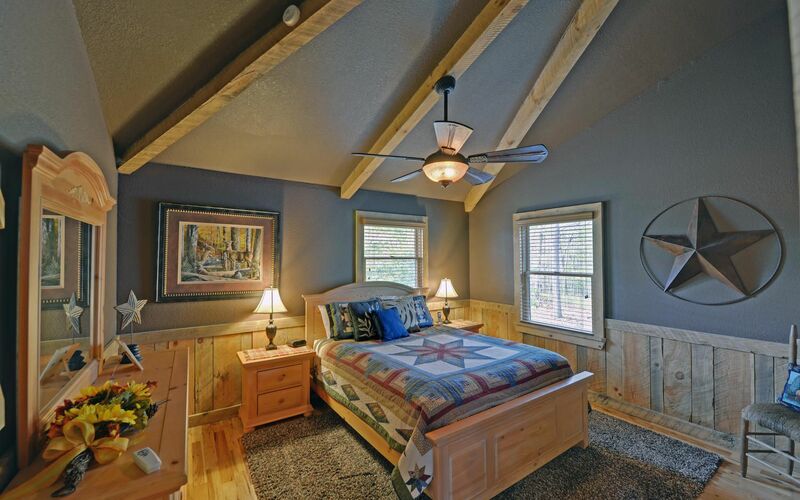 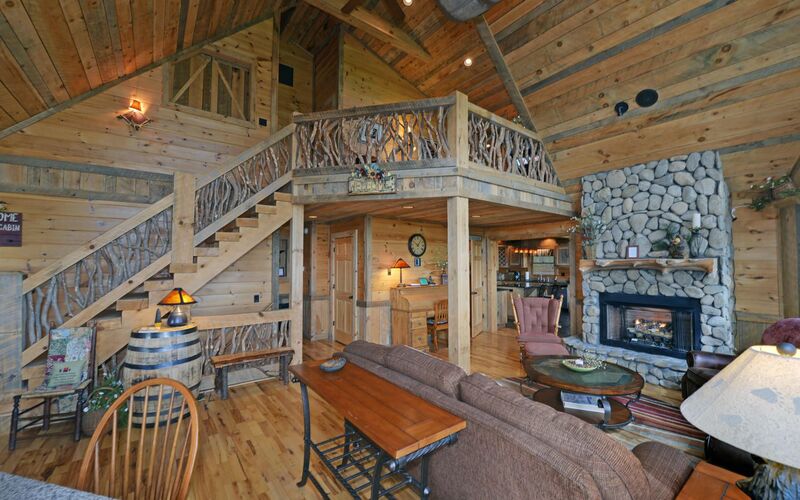 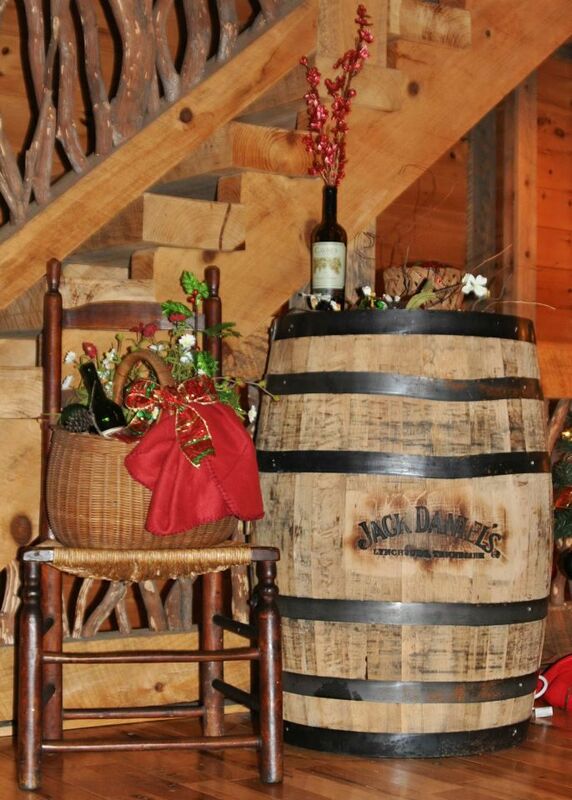 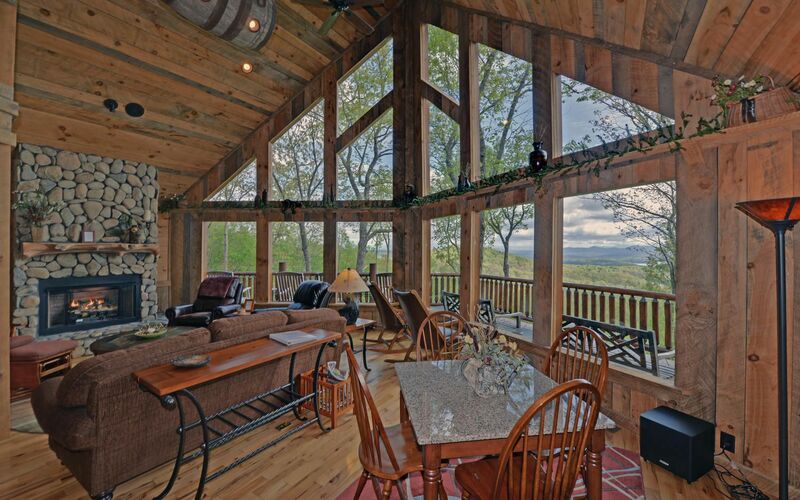 You'll appreciate the quality craftsmanship, detailed barn wood trim, handmade whiskey barrel light fixture in the great room, and the hand carved bears that make this a destination vacation cabin rental near Lake Nottely. 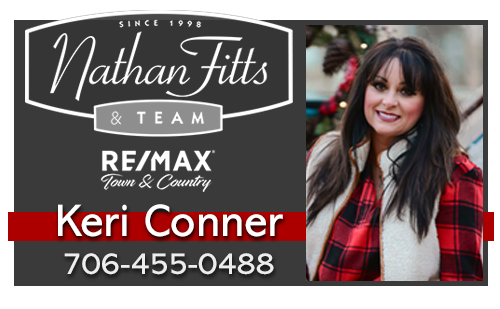 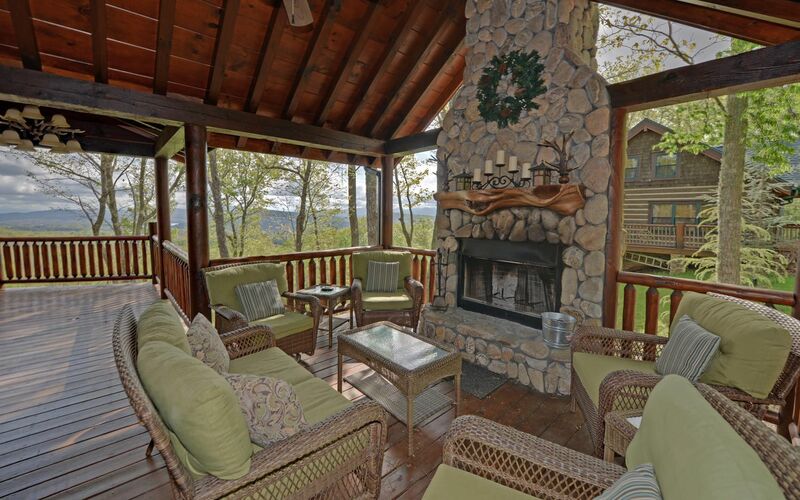 You might also like the wraparound porch with covered outdoor fireplace, the indoors gas log fireplace and the old fashioned rocking chairs. 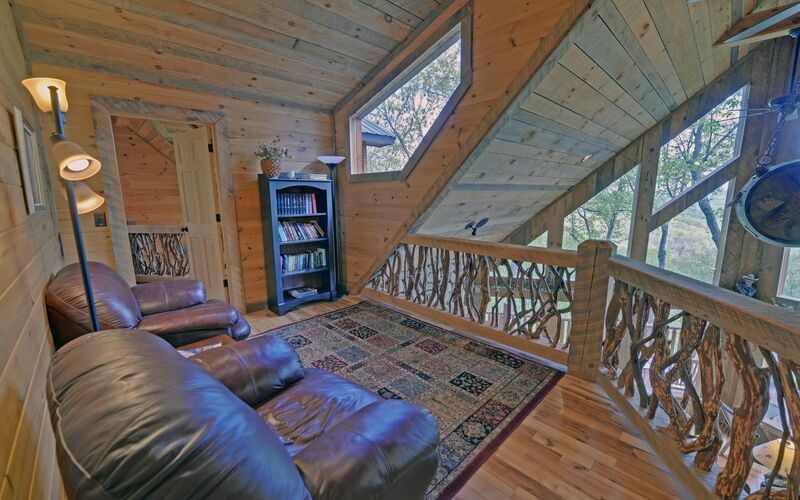 For extra cozy, lounge in the plush sofas and chairs, and maybe find a good book for the reading nook off the loft. 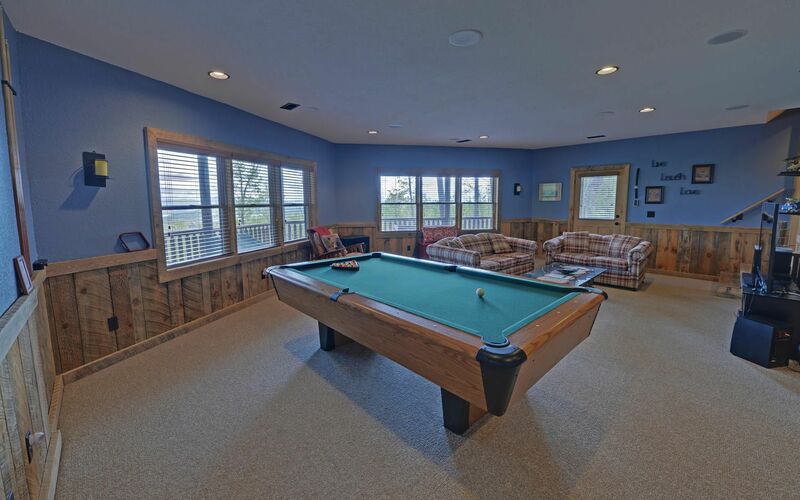 On the cabin’s terrace, have a pool table, hot tub, large flat screen and a porch swing looking out over the views. 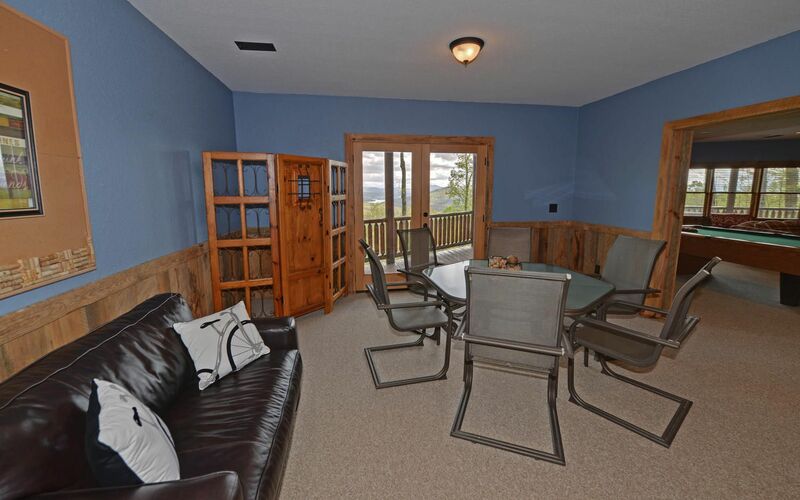 Also on the terrace level, is the third bedroom, bathroom and kitchenette. 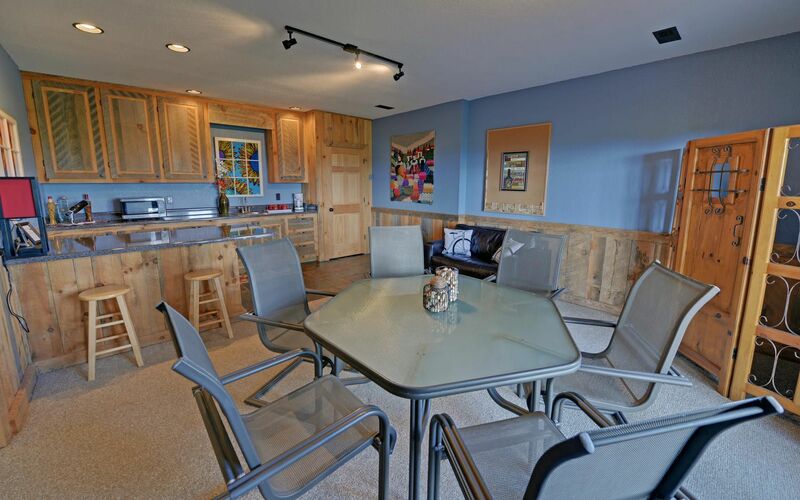 fully equipped kitchen and dining roomStainless steel and granite countertops ensure guests who chose to cook during their stay at Heaven’s Doorstep will be doing so in a beautiful workspace, furnished with everything they could need for a nice meal. 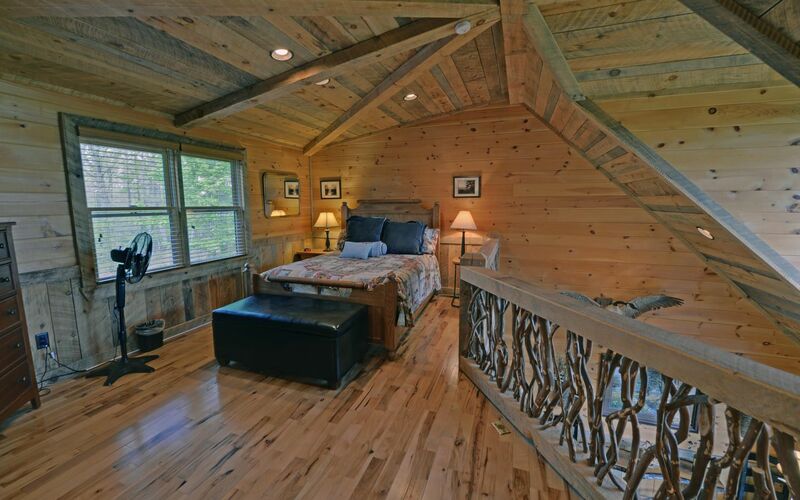 The loft has a bedroom with a shuttered window looking out to the view or over the great room below, and the bathroom on this level is shared. 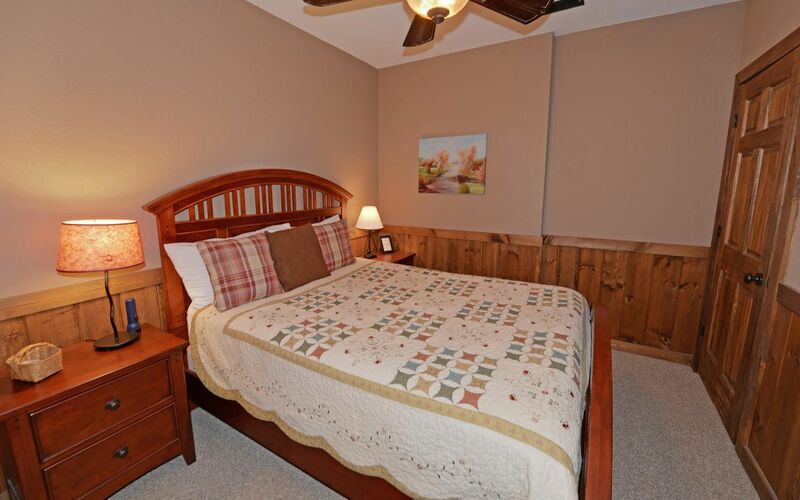 There is an open sleeping area towards the back of the loft. 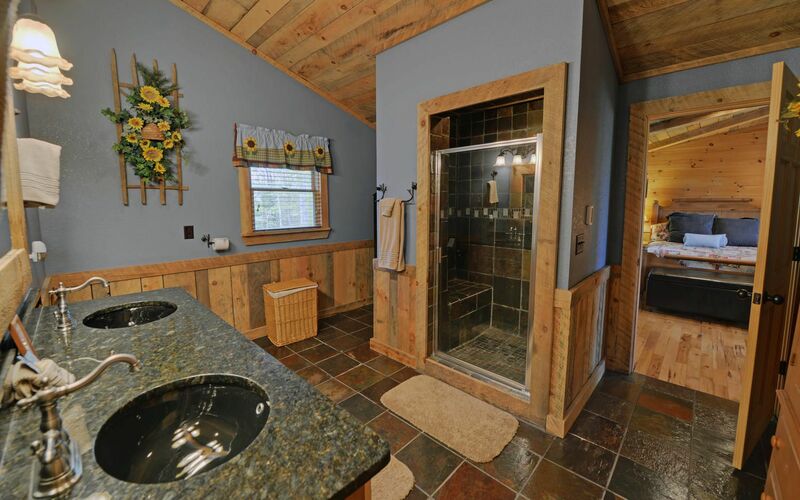 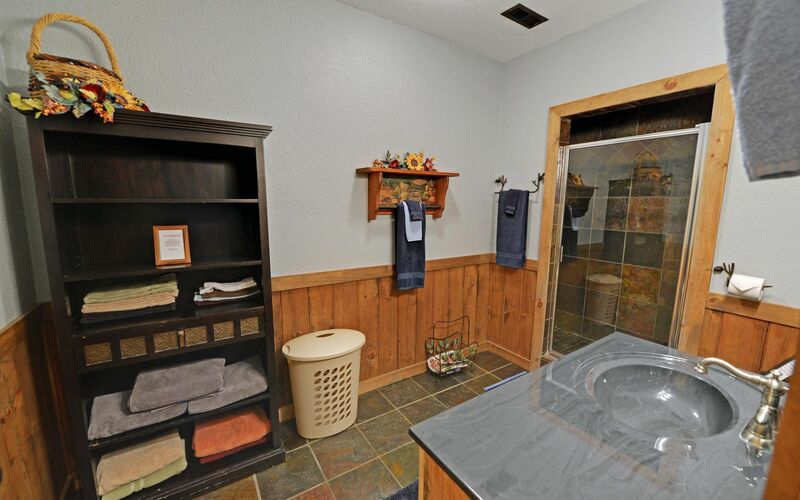 Slate showers and floors adorn the cabin bathrooms on each level, with the main level master suite also offering guests a Jacuzzi tub, multi-head shower, and heated floors. 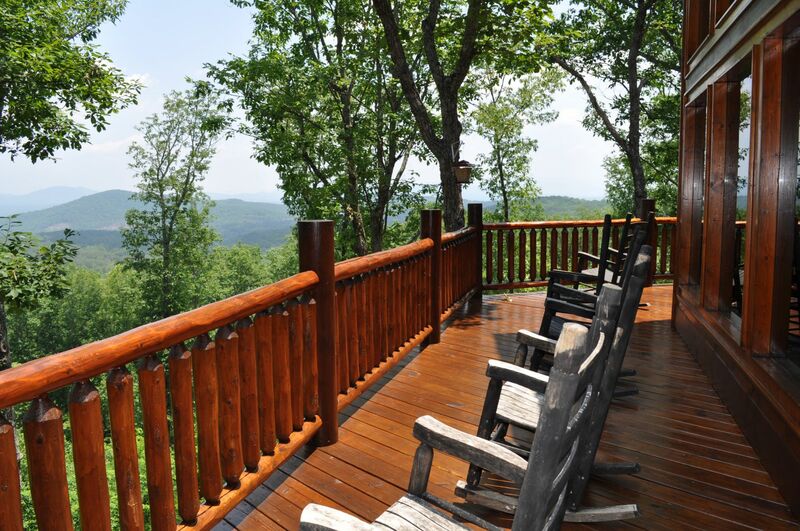 This is our third time renting Heaven's Doorstep and our family loves the cabin as well as the view. 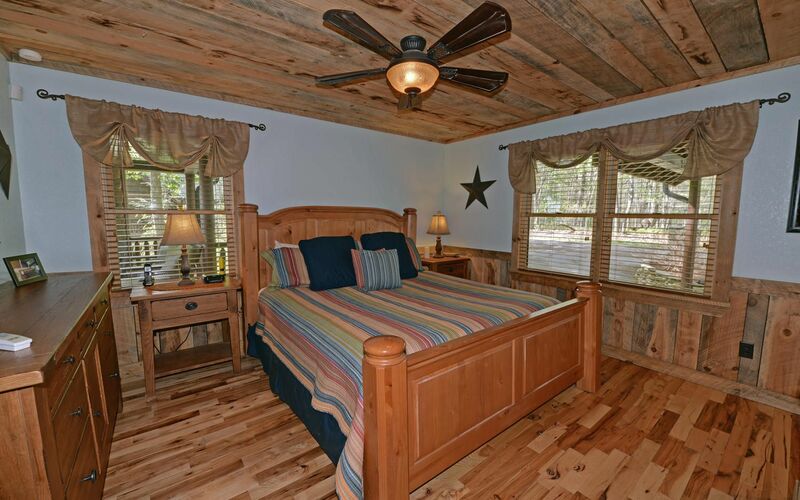 Thank you for sharing this amazing property with us. 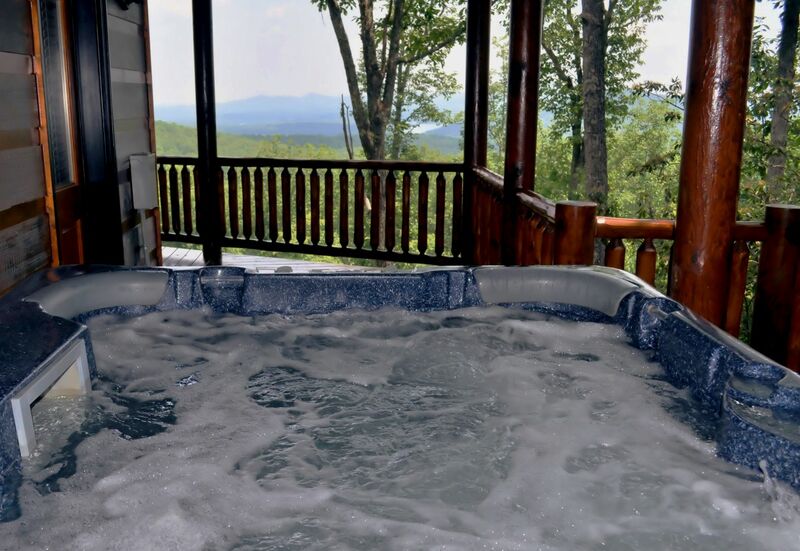 Heavens Door was the epitome of "escape to the mountains!" 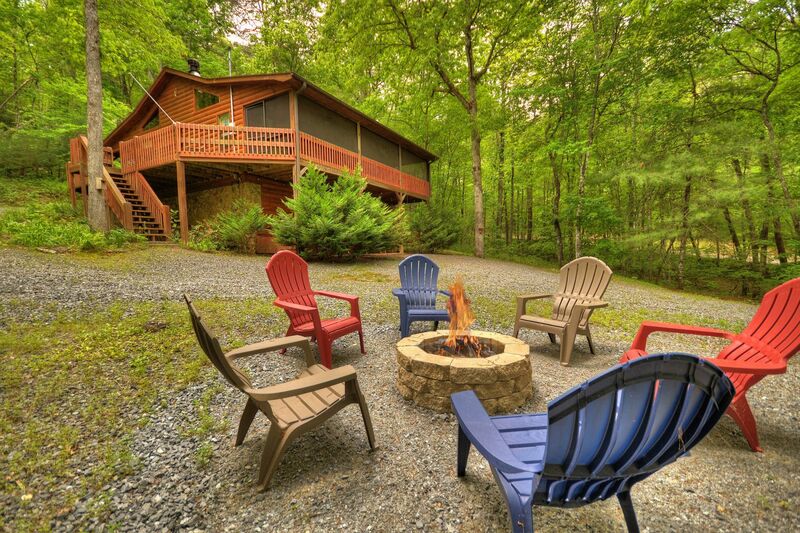 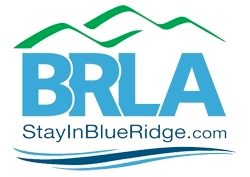 We treasure the moments of tranquility, snuggled up in the gorgeous cabin, surrounded by the forest, that overlooked the Blue Ridge Mountains and Lake Nottley.